Ancient ruins can take us back in time, providing historians, archaeologists and architects alike with clues about the daily lives of the great civilisations that inhabited them. But there are still many mysteries and secrets to uncover. We’ve recreated the interiors of some of the world’s most fascinating ancient ruins to reveal what experts believed they used to look like – and what happened inside. 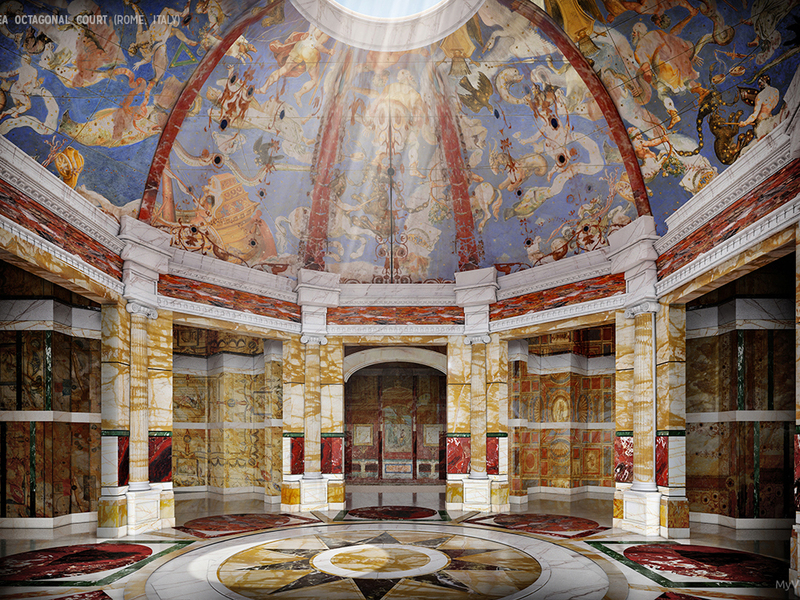 This bathhouse complex is a perfect example of the luxurious – and often ostentatious – Roman lifestyle. Constructed around 70 AD, the baths were an integral part of ancient Roman daily life. Offering citizens the chance to mingle, gossip and relax, the bathing culture showed the whole world just how superior (and clean) the Romans were. The steaming, geothermally heated water from the 'Sacred Spring' fills the Great Bath. While it’s in the open-air these days, the bath was originally covered by a 45m-high barrel-vaulted roof. This reconstruction lets you dip your toes in to get a little taste of the luxury. Sitting atop the hill at the Acropolis, the Parthenon was built in the mid-5th century BCE to house a monumental golden statue of Athena. We all know the outside of this iconic temple, but what went on inside? The gigantic statue was over 12m high and made of carved ivory and gold – 1,140kg of gold, to be exact. A basin of water sat in front of Athena to provide humidity, which preserved the ivory. This obvious display of wealth and power sent a very clear message to the rest of the world. And for those lucky enough to see the Parthenon from the inside in its heyday, the statue must have been nothing less than awe-inspiring. Constructed between 65 and 68 AD by one of Rome's most notorious emperors, the eponymous Golden House of Nero was a lavish palace complex that played host to the Emperor’s wild parties and banquets. The large, octagonal room had a concrete dome, most likely covered in glass mosaic. Roman historian Suetonius tells us of a 'circular banquet hall, which revolved incessantly, day and night, like the heavens.' He describes gem-encrusted walls, ivory and mother-of-pearl decorations and ceilings that showered guests with flowers and perfumes. Sounds like the height of luxury. According to Josephus Flavius, governor of Galilee, Herod the Great built the fortress of Masada between 37 and 31 BCE. It stands atop an isolated rock cliff overlooking the Dead Sea and is a place of undeniable majestic beauty. King Herod’s elegant, intimate residential palace consisted of three luxuriously built terraces. Here, we’ve reimagined the lower terrace, which was designed especially for entertainment and relaxation. It was surrounded by porticos, with walls covered in beautiful frescos of multi-coloured geometric patterns. In case that doesn’t sound luxurious enough, there was also a small private bathhouse. These ruins were first discovered in 1859 and provide invaluable insight into the daily lives of the Pueblo people. Sprawled over 27 acres, the ruins boast over 450 rooms and include a fully restored kiva. Built partly underground, the ‘great kivas’ were huge, round structures where people gathered to socialize, discuss important issues of the day or tuck into a communal feast. Visitors can find the restored kiva by walking the original trails that lead through the ruins. And if you can’t make it to New Mexico, this reconstruction should give you an idea of how this great civilization lived. This majestic building in the Forum Romanum was the greatest of all the Roman basilicas. Covering 6,500sqm, it acted as a meeting house, commercial area and administrative building. It was designed in a grand fashion fit for its prime location and importance to the Roman government and public. The spectacular Corinthian columns, multi-coloured marble floors and gilded bronze tile walls made this one of the most impressive buildings of Ancient Rome. The ornate details might have disappeared with time, but with this reconstruction you can get a sense of the basilica’s former opulence. Estimated to have taken around 30 years to construct, this complex was originally a Hindu temple dedicated to the god Vishnu. It transitioned to a Buddhist temple towards the end of the 12th century and is believed to be the world’s largest religious building. From afar, Angkor Wat appears to be one enormous mass of stone. Once inside, however, visitors will find a series of elevated towers, porches and courtyards on different levels, linked by a series of stairways. We’ve recreated one of Angkor Wat’s lush courtyards, and we think it looks like the perfect place for some mindful walking. The mysteries of what went on inside these ancient ruins have thrilled the imaginations of countless visitors yearning to travel back in time. Whether you dream of taking an opulent Roman bath or having a feast with the Pueblo people, these reconstructions give you a glimpse into life in these fascinating places.